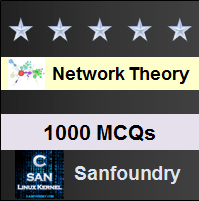 This set of Network Theory Multiple Choice Questions & Answers (MCQs) focuses on “Kirchhoff’s Current Law”. Explanation: Kirchhoff’s current law is based on the law of conservation of charge i.e, charge that flows in = charge that flows out. Explanation: Charge cannot accumulate at the node, it can only flow in and out of the node. Explanation: Kirchhoff’s current law can be applicable to nodes only. 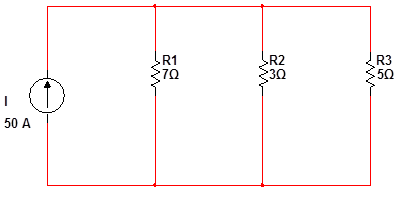 Explanation: All the resistors are in parallel, so the voltage across each resistor is the same V.
i1=V/7 ,i2 =V/3 , i3=V/5.By current law , 50A = V/7 + V/3 + V/5. On solving, we obtain V and then values of i1,i2, i3. Explanation: Here all the resistors are connected in parallel and let the voltage be V. Hence, i15=V/15 , i5=V/5 , i2=V/2 , i1=V/1. By kirchhoff’s current law, V/15 + V/5 + V/2 V/1 +5 = 10. On solving equation, we obtain the value of V. As all resistors are in parallel, voltage across each is same as V.
Explanation: Using KCL , 60mA = 10mA + 25mA + i3. Explanation: By applying the KCL at the node in the circuit , 5A = 2A +i3. Explanation: KCL states that the sum of currents entering and leaving a node is equal to zero. Explanation: By the definition of electric current, I=q/t. Explanation: By KCL, 5A = 0.25A + 2A + i3.